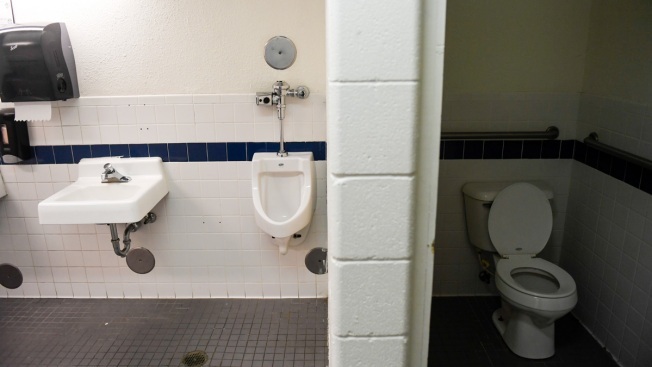 This Dec. 18, 2018, file photo, shows a urinal and one toilet in a public restroom. Two Honolulu police officers arrested Friday are innocent of allegations they forced a man to lick a urinal, a defense attorney said. Officers John Rabago and Reginald Ramones were charged with depriving a man of his civil rights. Federal authorities knew about the allegations for more than a year before the officers were indicted, said Rabago's defense attorney, Megan Kau. "This is not a complicated case," she said. "This is a case of one man saying that two police officers forced him to a lick a toilet bowl." Authorities allege Rabago and Ramones responded to a trespassing complaint where they came across the victim and forced him to lick a urinal in a public restroom, according to NBC News. Both officers maintain their innocence and will go to trial to fight the charges, Kau said. Lynn Panagakos, Ramones' attorney, didn't immediately respond to a request for comment. "While this morning's arrests cast a dark shadow on the department, I ask that the public please continue to support the officers who carry out their daily assignments with courage, integrity, and respect for the public," Chief Susan Ballard said in a statement. "The two officers who were arrested will have their day in court and be held accountable for their actions." The department placed Rabago, who has 17 years of service, and Ramones, who has 10 years of service, on unpaid leave.